At the end of the new film Liberal Arts – a sweet, campus-love-literature-coming-of-age story starring Elizabeth Olsen – the camera pans out from the leafy college town in which the movie is set, as a jaunty song starts playing. Although it had a medieval feel, it sounded so fresh, so contemporary with its syncopated rhythms, drums, and folky Mumford & Sons vibe, I thought it must be a modern reworking of an old tune by some hip music producer. But no. 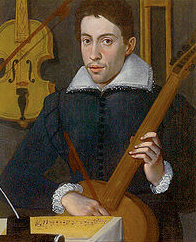 It was a madrigal called Zefiro Torna by Claudio Monteverdi, an Italian composer who lived from 1567 to 1643 and was a bit of an innovator in his time. He composed a lot of madrigals – secular pieces for voice – and is generally believed to have marked the transition from Renaissance music into Baroque. This is him, above, aged around 30 – a touch of Javier Bardem. 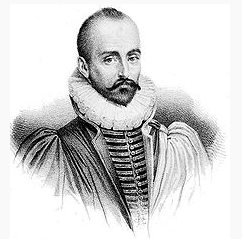 Monteverdi's modernity made me think of another Renaissance man who speaks so clearly to our generation, Michel de Montaigne (1533 to 1592) – a book about whom I am currently devouring (How to Live, by Sarah Bakewell). Montaigne was a French nobleman and writer of "essays" – free-floating think pieces with titles such as "Of Friendship" or "How we cry and laugh for the same thing". He jotted down whatever was in his head, while trying to answer the bigger question: what it feels like to be alive. By writing about the essence of human nature, and pondering the emotions and motives behind what people did – which, arguably, haven't altered over the centuries – his words still feel fresh today. "To read Montaigne is to experience a series of shocks of familiarity, which makes the centuries between him and the 21st century reader collapse to nothing," writes Bakewell. "Readers keep seeing themselves in him." Just as I mistook Monteverdi for a contemporary songwriter, so Montaigne, with his exhortations "Wake from the sleep of habit", "See the world" and "Do something no-one has done before", could be a 21st century self-help guru. In fact, they are both those things – modern men whose work resonates through the ages.